On The Paralegal Voice co-hostVicki Voisin welcome’s guests Ann L. Atkinson, ACP, NALAPresident, Michael Potters,CEO/Managing Partner of Glenmont Group, Inc.and Patrick Oot, co-founder of the Electronic Discovery Institute for a lively discussion about career opportunities for paralegals in the area of litigation support, particularly eDiscovery and technology. Websites and resources for learning more about technology. The Number One site that recruiters and employers turn to when seeking new employees. 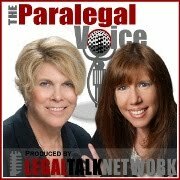 The Paralegal Voice also thanks its sponsors: Clio and NALA...The Association of Paralegals and Legal Assistants.